Central Authentication Service (CAS) is a legacy single sign-on (SSO) protocol for web applications. The name CAS also refers to a software package that implements the CAS protocol, which is now included in the Shibboleth IDP v3 package. The Gluu Server can be deployed with the Shibboleth IDP, which supports most of the CAS protocol v2 specification, including attribute release and CAS proxy support. CAS should only be used if there are legacy applications which only support CAS. Otherwise, all new SSO development should use OpenID Connect. Gluu provides two main scenarios involving CAS flows. By analogy with SAML scenarios let's call them "outbound CAS" and "inbound CAS". Outbound CAS is a traditional way to employ the protocol. Website or application (or, more likely, CAS client acting on behalf of them) redirects a user to a designated CAS server (in this case your Gluu CE instance) for authentication and authorization. CAS server authenticates the user, checks whether such application is allowed to request his/her personal data, then redirects user's browser back to the application/CAS client with a service ticket. The ticket is then validated by them by calling respective validation endpoint at CAS server via back-channel connection. Depending on protocol version and server's policies, some attributes may also be sent in response to validation call. In contrary, inbound CAS is a way for Gluu server itself to delegate authentication to some remote CAS server in your organization's network. By doing so it allows you to leverage your existing infrastracture and broadens your authentication options. From a technical standpoint it's just another custom authentication script which is already pre-packaged in your instance. You can find out more about how to configure it on corresponding Github page. In Gluu CE 3.x outbound CAS configuration is split into two different parts. First, CAS support must be enabled in web UI. Then applications which should be allowed to use this CAS server must be added to service registry - this part is done from Linux console (inside the container). After those mandatory steps are completed, you also may want to define a list of attributes which should be released in addition to user id which is sent by default (also done via Linux console). CAS client's configuration is beyond the scope of this article and will differ greatly depending on chosen software. All server's endpoint client may need are listed in the table at the start of the document. CAS is very demanding in terms of clocks' synchronization between CAS server and CAS client Make sure ntp is configured and running on both hosts, and their times are as close as possible before proceeding! Edit /opt/gluu/jetty/identity/conf/shibboleth3/idp/cas-protocol.xml.vm template file by putting a ServiceDefinition bean inside pre-existing reloadableServiceRegistry bean as exemplified below. You must use a regexp defining your application instead of "https:\/\/([A-Za-z0-9_-]+\.)*example\.org(:\d+)?\/. *" Pattern like ". *" may be used as a wildcard to create an "allow-all" definition for a test setup. At this point you should start getting a successful CAS ticket validation response from your Gluu server containing at least your user id (which is taken from uid attribute by default). Shibboleth IdP requires you to define all atributes it will work with when serving SAML and CAS requests in /opt/shibboleth-idp/conf/attribute-resolver.xml file. Though Gluu CE 3.1.6 doesn't offer complete CAS support in admin web UI, there is a neat hack which can make this step easier for you. 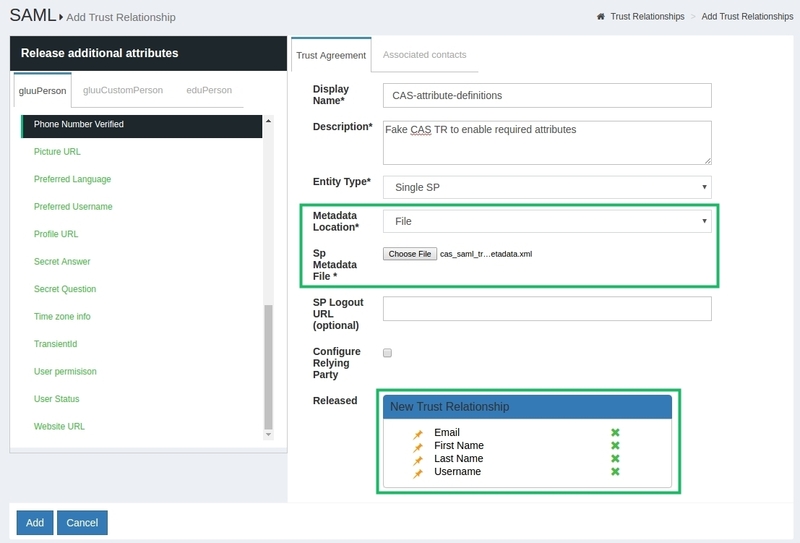 As all attributes added to list of released attributes of any SAML TR in web UI are automatically placed in the attribute-resolver.xml, you can create a "fake" SAML TR the only purpose of which will be storing attributes you need to release to all your CAS apps. Note that it has nothing to do with actual decision about whether each attribute should be sent to a specific requesting application (you'll learn how to do this in the next section), it just pushes all required attribute definitions to attribute-resolver.xml. So far our setup only has been releasing user id which may happen to be too limiting for most applications. 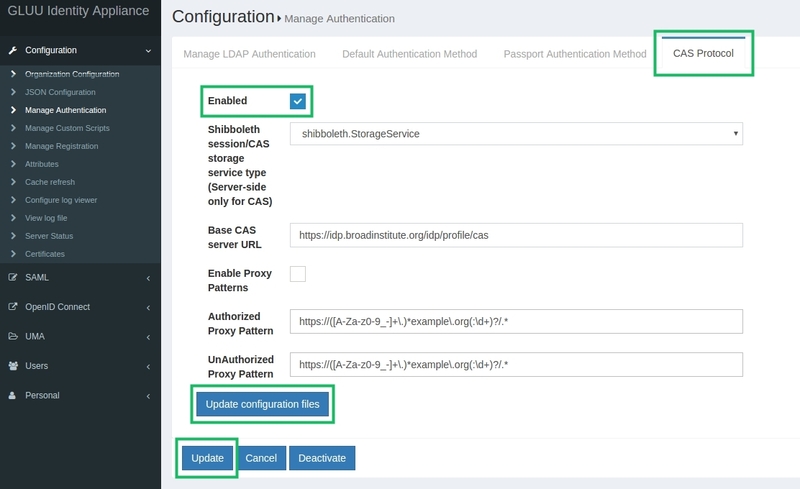 Being a part of Shibboleth now, CAS makes use of its powerful attribute release/filter policies engine to determine which attributes to send to each destination. Edit /opt/gluu/jetty/identity/conf/shibboleth3/idp/attribute-filter.xml.vm template file by putting an AttributeFilterPolicy bean provided below right before the closing </AttributeFilterPolicyGroup> tag at the end of it. Properties named attributeID you can see there are ids assigned to corresponding attributes in /opt/shibboleth-idp/conf/attribute-resolver.xml file (those are "internal names" which don't always correspond to names displayed in web UI); you can also learn them by checking the "Name" field when viewing attribute's properties in web UI (Configuration -> Attributes page) When placing the bean, be careful not to put it within some Velocity's loop there (note the control words startings with "#"). You must use a regexp defining your application instead of "https:\/\/([A-Za-z0-9_-]+\.)*example\.org(:\d+)?\/. *" Pattern like ". *" may be used as a wildcard to create an "allow-all" definition for a test setup. In case you'll need to add several CAS filtering policies, make sure their id properties differ. CAS supports SAML requests during ticket validation step. Corresponding endpoint is located at https://your.gluu.host/idp/profile/cas/samlValidate url and may be used instead of "native" CAS /serviceValidate if your CAS client supports it. Other steps of the general CAS flow stay the same. As inbound CAS is implemented with oxAuth's custom authentication script, the same rules as for other custom scripts apply. Most of events are rooted to /opt/gluu/jetty/oxauth/logs/oxauth_script.log file. General oxAuth log may also provide some clues: /opt/gluu/jetty/oxauth/logs/oxauth.log You can control verbosity of oxAuth's logs by editing log4j's configuration in WEB-INF/classes/log4j2.xml inside /opt/gluu/jetty/oxauth/webapps/oxauth.war package.